If you are looking for quick and simple for breakfast, this tortilla french toast recipe can’t be beaten! Start your day off tasty! If you love french toast and you love crepes, this is the perfect easy mix between these two favorite breakfast recipes – French Toast Tortillas! Once your tortillas are made to a french toast perfection, you can load them up with yummy toppings, just like crepes, and roll them up and enjoy! If you love this delicious breakfast option, make certain to try our Swedish Pancakes as well! Inspired by: Tortilla French Toast recipe by La Tortilla Factory, shared with permission. 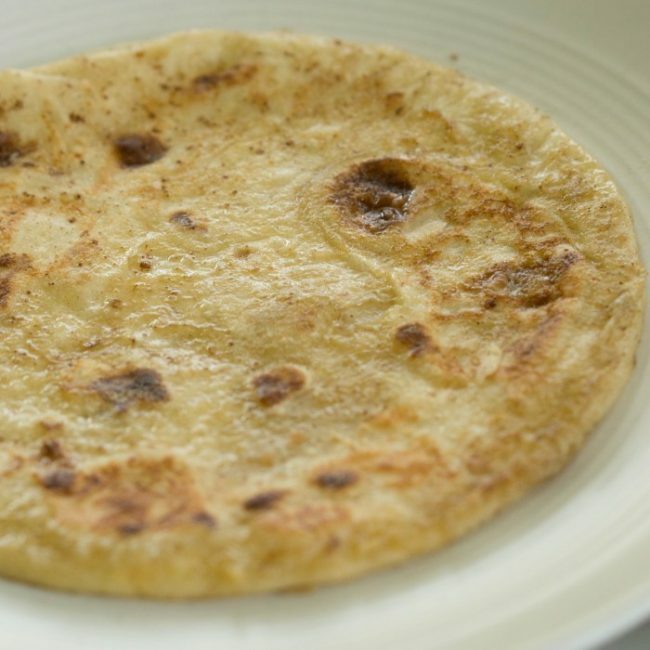 Makes: 8 french toast tortillas – Serves 4. You’ve got to see this really cute clip – even the kids agree! Combine eggs, milk, cinnamon, nutmeg, and vanilla in a square 8×8 baking pan. Use a fork or a whisk to evenly combine all ingredients and beat the eggs. Dip your flour tortillas into the egg mixture, coating each side with the batter. Cook over a medium-high heat on a non-stick skillet, until lightly browned on each side. Remove from heat once both sides are cooked. 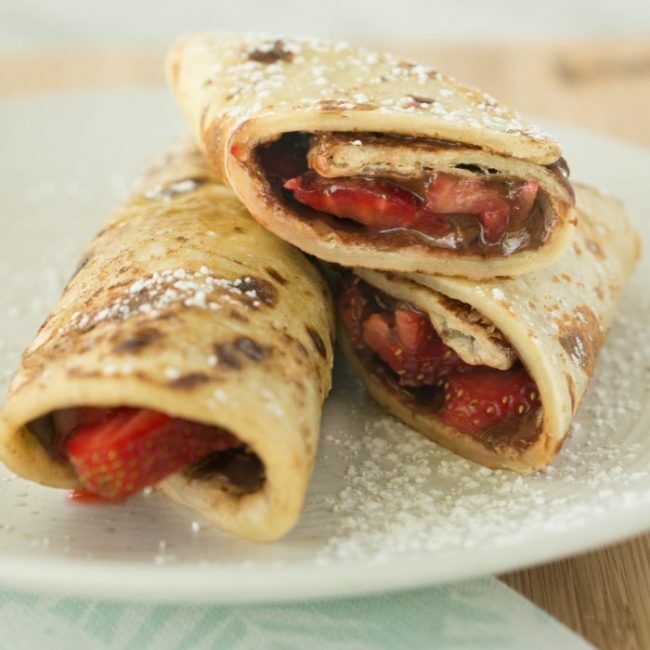 Spread nutella over the entire cooked french toast tortilla, then layer one half with strawberries, keeping to one side of the tortilla. Roll starting on the side with the strawberries. 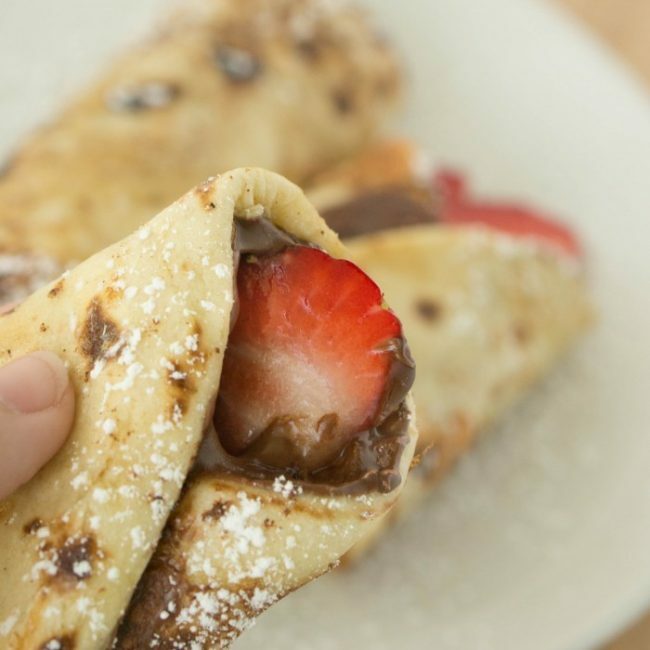 The nutella will help keep your rolled french toast tortillas together and make it so they are easy to pick up and eat, or serve on a plate topped with sprinkled powdered sugar. This recipe is so yummy that all of us were scarfing the french toast tortillas down! They feel so close to crepes, but without all that extra work and the french toast flavoring does so much for this recipe! This will become a regular on our breakfast rotation. Watch us make this recipe in 1-minute! Q: If you don’t want to use the tortilla, can you make your own homemade tortilla instead? A: Yes, homemade is always a great option! Q: How much Nutella should you use for this tortilla french toast recipe? A: Use however much your taste buds would like! Q: Is there a way to reheat these for later? A: These can be reheated for later or are simple to whip up fresh as needed. IF YOU LOVE THIS SIMPLE TORTILLA FRENCH TOAST, SPEND A FEW MINUTES TO SEE THESE OTHER BREAKFAST RECIPES THAT WILL BE AN AMAZING PART OF YOUR RECIPE COLLECTION! 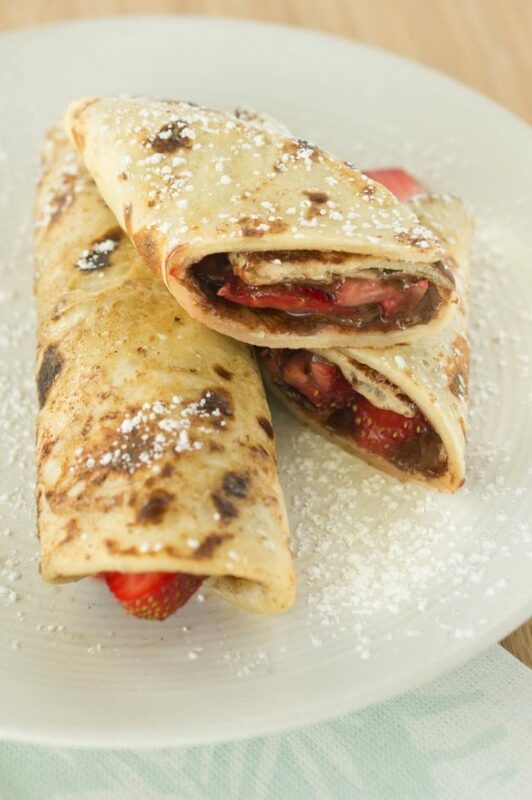 You’ll love our Crepe recipe! If you love this fun recipe, you’ll definitely enjoy these No Bake Oatmeal Bars! 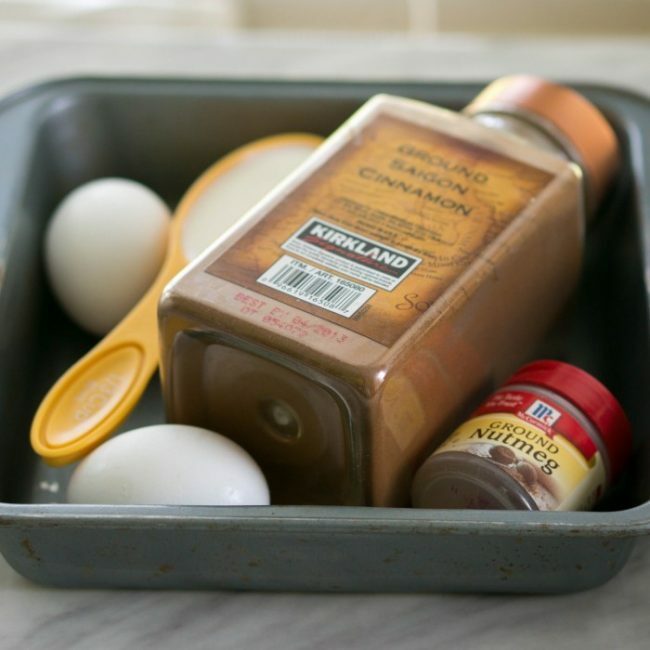 Combine eggs, milk, cinnamon, nutmeg, and vanilla in a square 8x8 baking pan. Use a fork or a whisk to evenly combine all ingredients and beat the eggs. 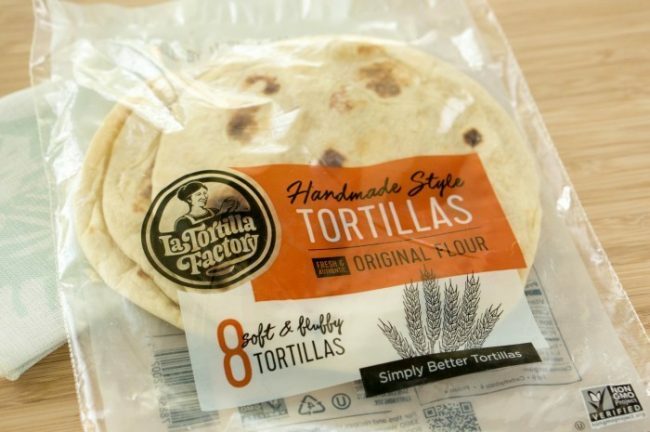 What’s your family’s favorite tortilla recipe? Mmm, this looks amazing! When the breakfast world, the dessert world, and the brunch world collide, they make french toast tortillas! These look so good. I have got to give this a try. I’ll be grabbing these items at the store the next time I go. Okay, this is a fabulous idea!!! My kids would just go crazy for these. So many filling ideas too! I love french toast so much! This recipe looks and sounds so good! I will be pinning this, would make a great on the go breakfast or snack for kids who are rushing out the door. What a great way to use tortillas! My daughter would gobble these up! I know what we are having for breakfast this weekend! I do love crepes but they are so time consuming. This looks so much easier and just as tasty. Hellllo Sunday brunch! These look amazing!!!! I love both of those things but never thought about mixing the two! What a delicious idea for a yummy breakfast! Oh yum! What a delicious meal idea. My kids are going to LOVE these. This looks delicious! An unique twist on French toast, using tortillas! I’d love to try this! Never knew that you could make French toast with tortillas! I have so many tortillas in my cabinet online I have a program and trying to figure out creative ways to use them. Thank you for the ideas. That looks amazing! French Toast combined with tortillas? Seems perfect to me! Om nom nom. Delicious idea!! Love how fancy it came out too, I’m sure everyone loved it!